Once upon a time, in a faraway island nation called the Maldives, there reined a President know as Maumoon Abdul Qayyoom who ruled the country with an iron fist for 30 long years. 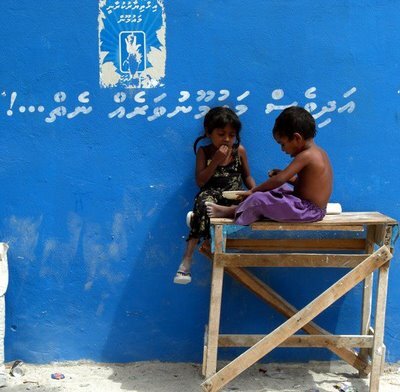 Maumoon’s policy in governance was a simple one, stifle the people to the extent that even what is their due as the citizens of the country was foreseen as a blessing from the dear leader himself. Maumoon’s presidency saw a lot of opposing figures come and go, their voices crushed beneath the supreme power he held within the security forces that served him and obeyed him without question. Then rose the biggest thorn in Maumoon’s side, Mohamed Nasheed or Anni as he is popularly known amongst the people. Maumoon’s attempts to silence Nasheed were many. But somehow, Nasheed proved to be as stubborn and tenacious than Maumoon, maybe more so in some ways and always managed to rise from whatever hellhole that he was banished to in order to punish him and anyone else who might get any bright ideas. Countless tussles, fights, imprisonments and court cases later, upon came the year 2008, by the time which a “new” constitution had been ratified which guaranteed a lot of freedom for the people of the country. And then came the elections and this is where you need to set aside your misgivings and enter an alternative third reality that tests your ability to impersonate Alice who found herself in Wonderland and couldn’t wait to get rid of it fast enough. Imagine the 2008 elections in which Maumoon and Thasmeen contested together won the elections with “90%” votes. That there was even no need for a second round of elections because lets face it, if there were to be no Maumoon, there would be no Maldives – or so we are told. When Maumoon and Thasmeen were sworn in on November 11th of 2008, it was with a sudden swiftness that the brutality and tyranny stopped. It was as if peace and calm had suddenly being sent to the Maldives from up above and there was not a soul who didn’t rejoice and revel in the days that followed. The People’s Majlis was sworn in with majority of votes received to Maumoon’s party, and as you can see this paved the way towards every bill they presented to the Majlis being passed with majority of the members saying “Yes”. Everyone banded together and worked for the betterment of the country except a disgruntled few of the Nasheed’s supporters. Meanwhile the media, the 4th arm of a democratic nation continued to thrive under the tender touch of the President, their fact-based reporting a thing that was envied even in countries like the United States and the UK. Corruption suddenly ceased to exist, everyone conformed to the rule of law and the Commissioner of Police even started to think about lay offs in order to reduce the number of officers who had nothing constructive to do to serve the country. The tourism sector saw the most drastic change. Sale of alcohol and pork was prohibited and for couples to be able to visit Maldives and its beautiful islands, they had to present their marriage certificate upon arrival. And then there came that defining moment when Maldives cut off whatever diplomatic or any other such ties with the state of Israel, going on to condemn and vote against the state whenever and wherever possible. Tourists from Israel were banned from entering the country and the President vowed that he would not bow down to international pressure on that one. Good stuff! Everyone from the atheists to those of religious beliefs other than Islam quickly converted back, and people continued to live in peace and harmony. The building of the bridge that Maumoon promised to the people of his country was in its final stages of completion and people were dreaming of the days when they would be able to zoom towards the Male’ International Airport on their motorbikes and cars at breakneck speeds with nothing but utter joy on their faces. Then along came the the December of 2011. All this time, Mr. Nasheed was not amused by what was taking place in his country. He couldn’t understand nor grasp the concept of people being given what they wanted, neither could he get on board with the ban of alcohol and lets face it, he couldn’t sleep after all ties were cut off with the state of Israel. Oh the horror of it all! 3- Dismantle the bridge that was being established between the capital and the airport. The whole thing reeked of corruption. 4- And yes, establish brothels in the country. C’mon, a guy needs different alternatives to release all THAT pressure. And so it went on, and it was heard from the speeches given by one of the few prominent businessmen and resort owners who had faced losses due to the bans imposed that the disgruntled police officers who were facing layoffs would find secure employment with them. Of course, Maumoon being the democratic leader he was tried to do whatever he could. But he could see that the paltry figures of the December 23rd Alliance were suddenly starting to gain strength. But as you can see, Maumoon was not the same man he was before the 2008 elections. He was a President who could digest and take in criticism, however ridiculous the criticism might be. And so came the pivotal moment when Maumoon arrested the Chief Judge in the “Islamic Court” of the country for the fear that he was involved with the opposition in bringing about changes to laws of the country that would allow all sorts of banned stuff legal once again. Oh, the audacity of the Chief Judge! This led to an uproar by the December 23rd Alliance and night after night the people belonging to the “cause” protested to free the Judge. The private media channels operated by the businessmen who were sympathetic and had to gain from the cause changed their tune and Maumoon found himself at the receiving end of abuse, half truths and lies being hurled at him from left and right. But he persevered and thought to himself, the people were behind him. And on the fateful day of the 7th of February 2012, Maumoon found himself stabbed in the back by his Vice President, forced to resign by perpetrators of a coup that rejoiced and celebrated even long before his official resignation on live television. NOW – snap out of the alternate reality and wonder at the chaos the disgruntled lot would rein if their roles were reversed and they were on the receiving end of a heinous coup and the worst betrayal ever to the people of this country. Think of the extents to which they would use WHATEVER and ANY means at their disposal to FIGHT for the ELECTED President who was toppled from power by violating every clause in the constitution. 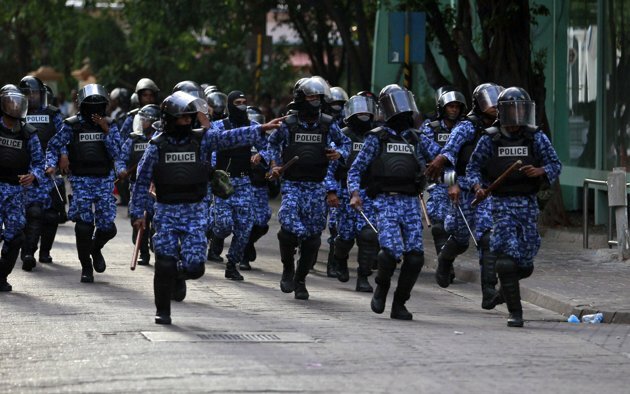 Envisage the destruction and chaos that would rein everywhere when their thirst for pandemonium is an evident one if you look back on the 22 nights of protests and the damages that were incurred to public and private property by the protesters in the city of Male’. Conceive of how the Parliament would react if the traitorous President were to open the session of Parliament for the year, the lengths to which members like Ilham, Mahloof and Riyaz Rasheed would go to, in order to prevent the coup President from giving his “Presidential Address”. Reckon the number of people who would then take to the streets, who would convene to stand against an unlawful President, to let their voices be heard in demanding an impartial investigation and to hold fresh elections so that democracy can once again be reinstated in a nation that is floundering and reeling from the impact of a coup. Operate on the ideology that the coup President doesn’t care and shows insolence towards the people who cry out against the atrocity, and respond back by shaking his fists in the air and making a mockery out of the voices calling out for elections. Move your thoughts along in the line of what Maumoon and his cronies are capable of, where it is the rights of just one family that the whole lot tries to protect and to serve. Me, I despair at the very thought of the future of this country now. I get this tightness in my chest and restlessness courses through my very soul every single time I think of the state of this country. I can’t believe the audacity of the coup President Dr. Waheed in undermining the people of this country and making a mockery of our religion by being even more brutal than, God forbid Maumoon himself. I can’t understand the logic followed by people who support this coup presidency, those who don’t see the injustice of everything that is happening right in front of our eyes. It was only yesterday that I saw a female protester surrounded by policemen in riot gear, the way they dragged her through the street because she dared to raise her voice and say what was on her mind. It was disheartening to see the public that were simply watching on, as if fascinated by the events that were unfolding, no one daring to rush to the woman’s defense because in a country where law enforcement can be bought off, there exists the modus operandi of the survival of the fittest. As Nickelback sings in the song “When We Stand Together”, there is a lesson to be learnt for everyone of us; if only we were to think beyond the realms of our comfort zone and embrace the harsh reality that is the Maldives today. As always, long live people’s power. Long live democracy! democracy. freedom. people’s power – nice words, eh? Eve wonder why they always use these words? Sweetheart, you dont know Nasheed. You dont know Democracy. You dont know people’s power. But sweetheart, you write very well. Very impressive, indeed. And btw. thank you for the compliment.